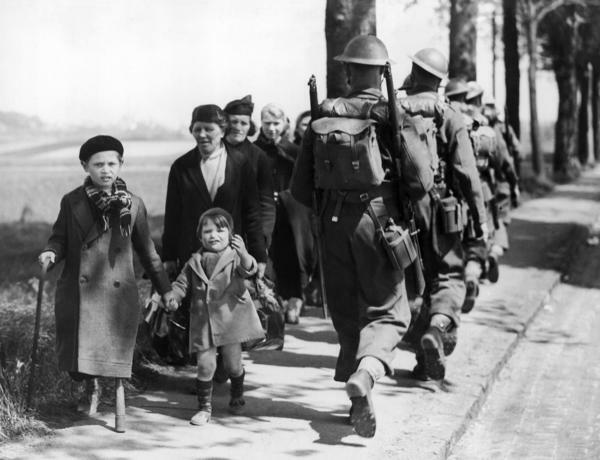 International law on refugees has its roots in the massive displacement that occurred in Europe during World War II. Above: Belgian refugees fleeing after the German invasion of their country in 1940. Members of a caravan of Central Americans who spent weeks traveling across Mexico walk to the U.S. side of the border to ask for asylum on April 29, 2018. What are the international rules for dealing with foreign nationals who show up in a country often without any travel documents and definitely without a visa? It's a timely question in this era of unprecedented refugee movement, as nations around the world struggle to deal with huge numbers of uninvited migrants who've appeared at their doors. Bangladesh now has nearly a million Rohingya refugees living in camps just inside its territory and local officials say they want to send them back to Myanmar as soon as possible. Italy is refusing to allow boats carrying African migrants to dock in its ports. Jordan, Lebanon and Turkey are hosting millions of displaced Syrians. In Germany Chancellor Angela Merkel has been scrambling to hash out a migration deal to keep her government together. Uganda despite being a low-income country has recently taken in hundreds of thousands of people from South Sudan and the Democratic Republic of Congo. And the United States came under fire for separating migrant children from their parents when those families attempt to cross the U.S. southern border. International law is quite clear on the matter. According to the 1951 U.N. Convention Relating to the Status of Refugees, migrants who've crossed an international border to seek asylum should not be discriminated against, penalized or sent back to a place where they could be in danger. "If someone arrives in a country without authorization, really the only recourse they have to stay in that country is if they have a claim of persecution under the refugee convention," says Susan Fratzke, a policy analyst at the Migration Policy Institute in Washington, D.C. She adds as a caveat that they may also be allowed to stay under a few other circumstances, for example "if they fear return to their country for some other reason." International law scholars say the Trump Administration's most recent migration policies violate all three of the Refugee Convention's central tenets. The so called "refugee convention" was hammered out after World War II and originally applied only to refugees from that conflict. "When the convention was signed [in 1951], there were still a large number of people in Europe who hadn't been able to return home or were afraid to return home and were seeking access to other countries," Fratzke says. One of the most important elements of the convention is that it prevents countries from sending refugees back to a country where their lives could be in danger or where they could face persecution because of their "race, religion, nationality, membership of a particular social group or political opinion." Under the convention countries are only allowed to expel refugees if they pose a threat to national security and only after a hearing to determine the legitimacy of their request. If they're granted asylum refugees are allowed among other things, the right to work, freedom of religion and access to the same social services available to other residents. The convention was updated in 1967 to apply globally and not just to the victims of World War II. The convention was never intended as an avenue for migrants to seek better economic opportunities in wealthier countries. Under international law, the bottom line is if you cross into a country without authorization and you're not a refugee, local immigration authorities have every right to send you home. Many of today's migrants who are turning up in dinghies on the coast of Sicily or stumbling out of the desert in Arizona, perhaps not surprisingly, are now stating that they're refugees. And this poses a challenge for countries. "The grounds on which you're granted asylum are very specific and it requires in most cases an in-depth examination of someone's personal history," Fratzke says. "Because that takes time, it can open up asylum systems to exploitation by people who may want to take advantage of the fact that an asylum claim takes one to two years or even longer to process. And that would allow you access to the country even though you don't have the right to asylum." 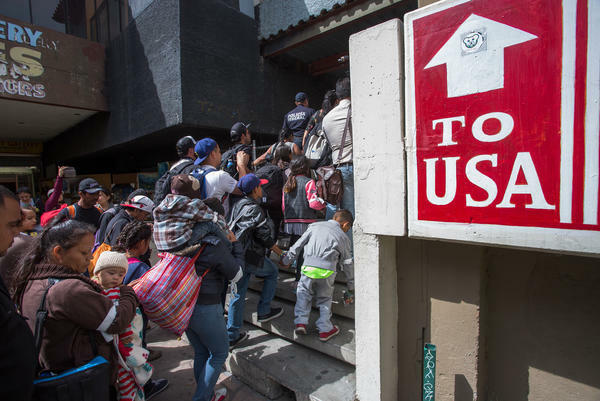 The assertion that people are abusing the asylum process is part of what's driven Attorney General Jeff Session's new "Zero Tolerance" policy cracking down on migrants illegally crossing the southwest border. "The situation at our Southwest Border is unacceptable. Congress has failed to pass effective legislation that serves the national interest — that closes dangerous loopholes and fully funds a wall along our southern border," said Sessions in April. "As a result, a crisis has erupted at our Southwest Border that necessitates an escalated effort to prosecute those who choose to illegally cross our border." He also said that migrant children would be separated from their parents to deter people from crossing. "If you don't like that, then don't smuggle children over our border," Sessions told a law enforcement convention in Scottsdale, Arizona, on May 7. After a huge public outcry, the government eventually backed away from the child separation policy. Sessions, however, is sticking with plans to criminally prosecute anyone who sneaks crosses the southern border. But that policy when applied to migrants who are seeking refugee status in the U.S. is illegal under the 1951 U.N. Convention Relating to the Status of Refugees. "The U.S. is in flagrant breach of Article 31 of the Refugee Convention," says law professor James Hathaway, who directs the University of Michigan's program on refugee and asylum law. Article 31 states that countries cannot "impose penalties" on asylum seekers for having illegally crossed the border. "And this is quite a critical clause in the current contemporary environment," Hathaway says. "Because the drafters realized that no country including the United States gives refugees a visa to come make an asylum claim. There is no way to arrive other than illegally. You have to either just show up without permission or you have to lie to get across, there is no alternative. So states agreed in that specific treaty that as long as a refugee comes forward and says that he or she crossed unlawfully and claims asylum, he or she will not be penalized for being here illegally." Yet prosecuting anyone who enters without authorization is at the heart of the Attorney General Sessions' zero-tolerance policy. Most migrant children in addition to having the right to protection under the 1951 Refugee Convention also have specific rights under the 1989 U.N. Convention on the Rights of the Child. That treaty states that governments have a responsibility to "take all available measures to make sure children's rights are respected, protected and fulfilled" regardless of where that child is from. "The punitive separation of families in order to deter people coming to seek protection is just flagrantly unlawful," Hathaway says — except that might not be the case for the U.S. The Convention on the Rights of the Child state that the "best interests of the child must be the primary concern" in any decisions regarding that child. But the U.S does not have to go along with this provision because after South Sudan and Somalia ratified the convention in 2015, the U.S. is now the only country in the world that has refused to sign. "So the United States is not bound by that obligation which is why the United States was able to separate children in the way that it did," says Jacqueline Bhabha, a professor at the Chan school of Public Health at Harvard who's written extensively about child migration. "No European country or other country would be able to do that [separate families] because it would immediately violate the Convention on the Rights of the Child. Now of course in the U.S. it violated people's sense of common decency. And so that's why the administration, I think, had to do an about turn. But it wasn't actually breaking any explicit legal obligation like it would have been if it had been done say in Germany or in Portugal." Another U.S. position on refugees that has raised concerns in the international community is the Trump's administration so-called Muslim ban. The Trump administration's policy of blocking refugees from five predominantly Muslim countries (plus Venezuela and North Korea), Bhabha says, also violates the U.S.'s obligations under the Convention on Refugees. Article 3 of that convention (which the U.S. has agreed to by signing an update to the 1951 Convention that was written in 1967) says that governments are required to provide protection to refugees regardless of their country of origin. Bhabha points out how blocking refugees from Iran and Yemen violates the spirit and letter of the Refugee Convention. "Yemen and Iran which are on the banned list make homosexuality a capital offense," she says. "So if you're found and convicted of being homosexual in Yemen or in Iran you could face the death penalty. People in that situation can no longer apply for asylum in the U.S. So that's really a devastating reversal." It's not just the U.S. that's grappling with who should or should not be allowed to enter as a refugee. The issue is riling Europe. And Australia has been sharply criticized for shipping any asylum seekers who attempt to arrive by boat to processing centers in Nauru and Papua New Guinea, where they often languish for years. Globally the vast majority of refugees are currently being hosted in low- and middle-income countries – frequently because they're the nearest safe haven — which has put huge burdens on already struggling governments. To try to deal with this there's a movement at the U.N. to rethink the global asylum system and more evenly distribute refugees. Talks are under way to come up with what's being called a new Global Compact on Migration. But those talks are now taking place without the United States, which pulled out of the negotiations late last year, saying in a statement that this United Nations effort is incompatible with U.S. "law and policy."